Shannon at Rocks in My Dryer hosts a wonderful round up each week called Works for Me Wednesday. I thought I would jump in this week with a couple of things that have worked well for us with Little (my 10.5 months old daughter). These may or may not be things that you have already figured out, but they were great discoveries as a first time mom. First up is the Nuby straw sipper cup. Being exclusively nursed until a few weeks ago, Little had a tough time figuring out how to use a regular spouted sippy cup. 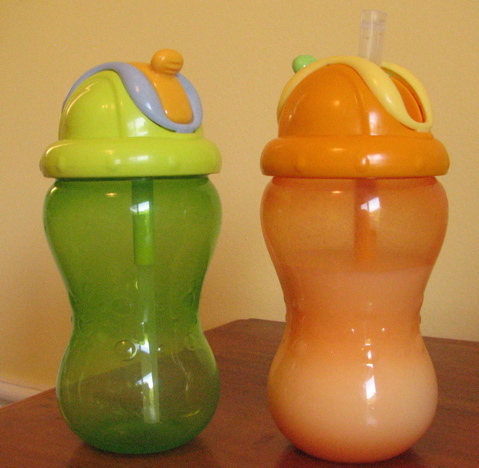 A friend suggested that I try these cups as they had worked well for her son (who was bottle-fed, but couldn’t figure out how to tip the sippy cup to get to the good stuff). Little figured the straw out right away, and they have been wonderful. Next is our make-shift TV guard. When Little began pulling up she quickly discovered the buttons on the TV. It wasn’t really a safety problem, but it started to get annoying when she became good at turning the TV off and on. I had heard of clear plastic TV guards that adhere to the front of the TV to keep little fingers away from the buttons while still allowing the remote to function properly, so I checked them out on Amazon. The problem is that the area of our TV where the buttons reside is curved, so the adhesive type of guard wouldn’t work for us. I had a picture in a clear acrylic frame on top of the TV and thought, “Hey, this might work until we can find something else.” I removed the picture from the frame, slid the bottom part under the TV, and, voila, a guard that protects the buttons from Little without blocking the signal from the remote. So, that is what is working for us right now. Head over to Rocks in My Dryer to see what is working for others in the blogging world. You are currently browsing the archives for the WFMW category.